Front and/or back Can't find 'em anywhere. Let me know if anybody has them. You need the ones with the rub strip? I found that 74 front using zoomthelist.com to do national craigslist searches. Mcarlo77 wrote: You need the ones with the rub strip? I'd prefer those, but I won't shoot myself if I can't find them. Thanks...I'm a little reluctant to try one of those cross country deals via CL...mostly because I never have. I may try it. I've tried serchtempest...never heard of zoom. Anybody know if I need the inner bumper too? Or are they the same 73-77? Inners on '76/'77 ARE different. Stick with '74/'75 inners with '74/'75 bumpers. 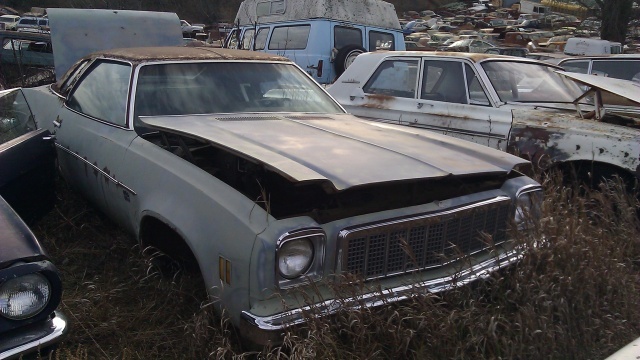 I checked two '74's (one was a Laguna) last weekend at my favorite salvage yard and bumpers w/rub strips were not good. There are others in that yard, but don't recall any with rub strips. 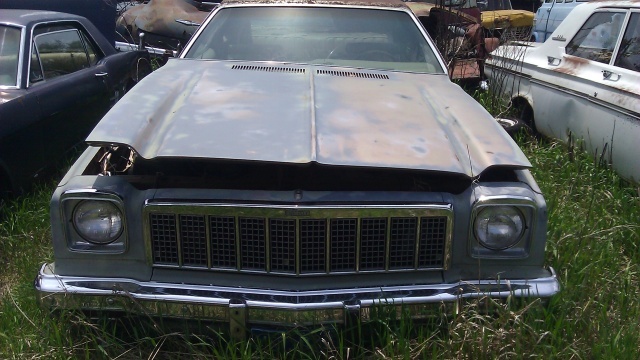 Here's a '75 w/o rub strips sitting in a yard I want to visit again in the next week or so that may have potential. Looks like they have a nice shine and don't see any evidence of damage when I enlarge my photos. No idea what they'd want for them as this yard is under new ownership...but, I can guarantee they won't be as cheap as the $50 in that Craigslist ad. Speaking of which...that "small" dent the Seller mentions looks to be a little more significant when you look closely around the parking light opening and bottom edge of bumper. Personally, I'd pass on it. I'll never figure out how you manage to find decent G3 stuff up in frozen, salty Frostbite Falls and I can't find anything older than 1995 around here. If you find something, let me know. I really appreciate the effort. I might be able to use the rub strips off of my 77 bumpers anyway. You could always drill a bumper without the strips & use the strips you have. 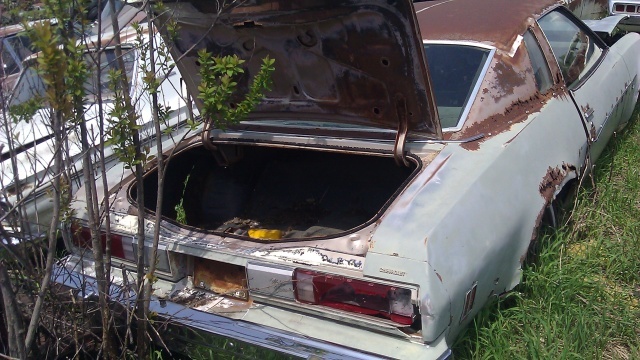 I have a rear from which I think is a '76-'77 Elco. I'll have to look in my stash to see just what I may have .A front from '76/'77 also I believe.